These international and local wildlife films are finalists in the ROSCAR Award film competition which attracted 267 entries from 22 countries across the globe. From Australia to India, Czechoslovakia to France, Germany to Zimbabwe, UK to South Africa, and many more countries which are producing breathtaking wildlife programmes. The films were entered into the various 15 ROSCAR Award categories which included amongst others; Best Cinematography, Best Environmental Production, Best Presenter, Best Expedition/Adventure and Best African Filmmaker Award. 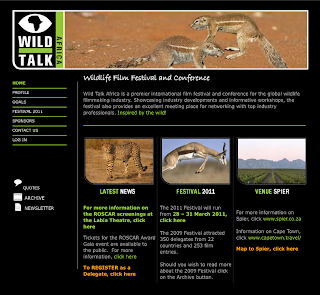 They were then judged by well-known professionals in the wildlife filmmaking industry, from international broadcasters to some of the most experienced filmmakers. Finalist films include BBC's Nature's Great Event: The Great Tide, Echo: An Unforgettable Elephant by Mike Birkhead Associates, Peace for Seals produced by Dvanact Opic Ltd, Off the Fence's Shark Night, and an Alvaro Mendoza Film, Gaia's Choice to name a few. To view the Labia programme for the films, click here.